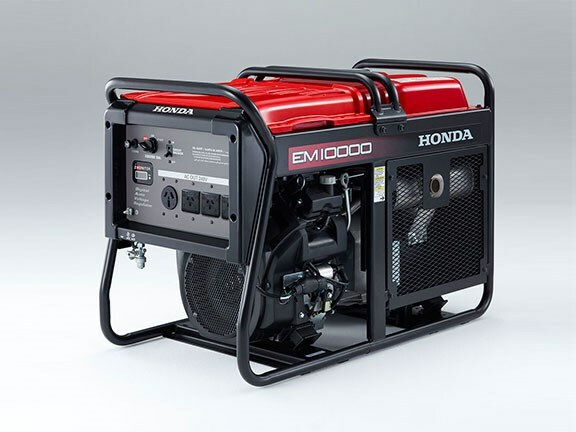 Honda’s EM10000 industrial generator is a 9kVA model that delivers 9000W/240V AC for use on worksites and on farms. Honda Australia says the EM10000 has a 31-litre fuel tank and has the best fuel consumption in its class, being able to run for a solid 6.5 hours at 8000W. "The EM10000 features Honda’s i-Monitor display, a liquid crystal screen that allows the user to quickly access and view crucial engine readings and information such as an hour meter, output voltmeter, battery voltmeter and error coding," Honda says. "There is also a prominent red oil warning light on the same panel." A Digital Auto Voltage Regulator (D-AVR), digitally calculates the effective voltage in the EM10000 from the output voltage waveform, by area calculating with a microcomputer. The effective voltage can be found with high accuracy even when the output voltage waveform is deformed; meaning that the EM10000 will maintain voltage integrity to deliver more stable power. The unit has a DC output of 3x15A and 1x60A (plug included). Honda says that, with a 99.3dB noise level at rated power, the EM10000 is the quietest in its class, adding that its quieter, smoother continuous operation being due to improved crankcase rigidity, an extra-durable crank shaft and optimised cam shape. 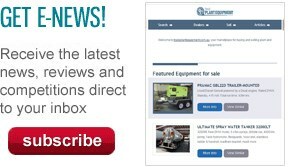 "The large Smooth Flow exhaust also assists in reducing the noise level with a unique muffler configuration," the company says, "meaning that this beauty can be used for applications where sound restrictions apply, or where noise pollution may be an issue." The generator is powered by a 90-degree V-twin GX630H petrol engine. A centralised muffler draws cold air over the engine components that need it the most, reducing the likelihood of the unit overheating. The unit measures 973mm long by 552mm wide and 965mm high, with a dry weight of 162.3kg. The Honda EM10000 generator costs $5990 including GST and comes standard with a 4-year domestic and 1-year commercial warranty. It is available through Honda Power Equipment Specialist Dealers.